The Department of English & Creative Writing welcomes author Yiyun Li to Dartmouth College for a reading Thursday April, 11th, 2019 at 4:30pm in the Sanborn Library. Yiyun Li is the author of five works of fiction, Where Reasons End, Kinder than Solitude, Gold Boy Emeral Girl, The Vagrants, A Thousand Years of Good Prayers, and the memoir Dear Friend, From My Life I Write to You in Your Life. Her work has appeared in The New Yorker, A Public Space, The Best American Short Stories, and The O. Henry Prize Stories, among other publications. 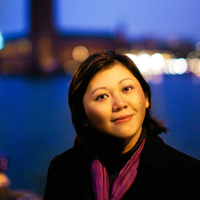 Yiyun Li was a 2010 MacArthur Fellow. Li will be reading for the Cleopatra Mathis Poetry & Prose series, Thursday April 11th, 2019 at 4:30pm in the Sanborn Library. This event is free and open to the public. Light refreshments will be provided. Li's work, including her recently released novel, will be available for purchase courtesy of the Norwich Bookstore. The Sanborn Library is located on the first floor of Sanborn House, 19 N. Main Street, Hanover Nh. The main entrance to Sanborn House can be found to the left of the main Baker Library entrance when facing the bell tower from the Dartmouth green.